This is a matching set of a monogrammed tee shirt and a monogrammed hair bow. 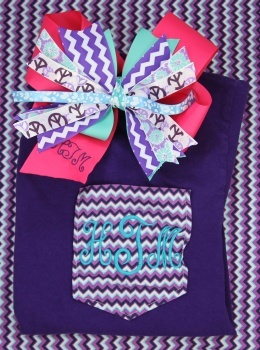 Purple and turquoise small chevron stripes decorate the pocket of this tee shirt with monogrammed letters in a matching turquoise color. The bow has a pink base bow that will have the front tail embroidered in purple thread. The bow is a pinwheel style that will have various prints that will have purple, turquoise and pink colors to match. This monogrammed set is the perfect gift for your little cutie!